Greek legendary singer/songwriter Lavrentis Machairitsas accompanied by yet another legendary singer/songwriter Miltos Paschalidis and their band comprised by some of the finest musicians gave a memorable performance during AKTINA’s Greek Music Journey concert series at New York’s historic theater the Kaye Playhouse at Hunter College. 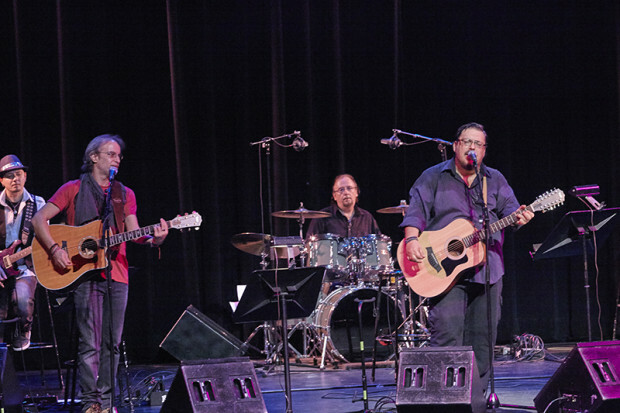 This benefit concert for public service media AKTINA FM and AKTINA TV was co-presented by the cultural non-profit organizations AKTINA Productions and CYPRECO of America. Machairitsas who was AKTINA’s guest two years ago, returned to New York fully charged and with a new program capturing the hearts of all in attendance once again. The concert which was crowned with huge success has also been the main talk on social media with people sharing their positive reactions, photos and videos terming it one of the most captivating performances thus far. A full house of guests comprised AKTINA’s and CYPRECO’s fans and supporters Greek and non-Greek of all walks of life and ages enjoyed an unforgettable performance that lasted for 2 ½ hours filled with exceptional songs. 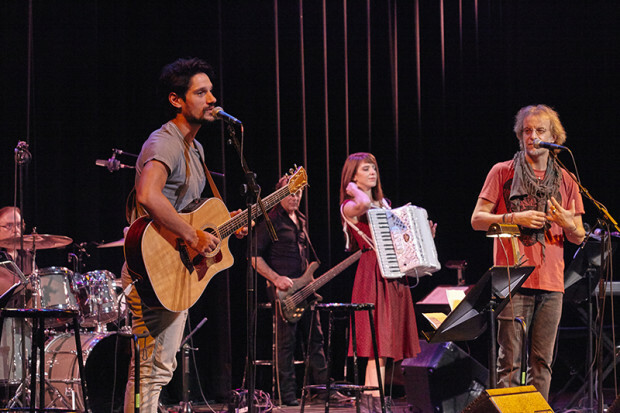 Lavrentis Machairitsas and Miltos Paschalidis were accompanied by the soloists Steve Tesser, electric guitar/vocals, Mirela Pachou, keyboards/accordion/vocals, Akis Amprazis, base and Philippos Spyropoulos drums. Referring to the success of this latest musical performance, Elena Maroulleti, the concert’s Executive Producer and President of AKTINA and CYPRECO stressed that, “everyone had an amazing time and this is our greatest reward. Everyone was engaged from beginning to end. Seeing the joy and happiness on people’s faces and then receiving their warm congratulations is indeed the greatest reward! We are fully committed to continue our cultural mission of bringing only the finest artists and promote the most representative aspects of our rich musical inheritance. We look forward to seeing all of our friends again on April 22nd when we bring to New York yet another amazing performer, Eleni Tsaligopoulou and her band Bogaz Musique”. Machairitsas who stands out for his humility and unique character embraced the audience with exceptional warmth engaging them from beginning to end. He related unique stories about each song he presented and throughout the performance he was showered with applause and cheers, while everyone participated in singing and clapping along. Referring to his new performance in New York, he expressed exceptional thanks to AKTINA and to the concert’s executive producer Elena Maroulleti for bringing him back, for promoting his music and more importantly for their commitment of always producing very worthy concerts featuring the different aspects of the representative music of Greece and the artists who serve it. The evening revived loved songs from the rich discography of both Machairitsas and Paschalidis, as well as songs by other great songwriters and composers which the two artists performed together. The multi-talented Mirela Pachou on the keyboards, accordion and vocals who further enthused the audience as she eloquently circled the stage playing the accordion as he accompanied the artists, had an even more exceptional moment when she performed her hit “Mirela” from her recently released personal album. Other exceptional moments included the impromptu performance of Panos Vlachos, a renowned actor/singer/songwriter from Greece who was present and who was invited on stage by Miltos Paschalidis to perform together “Agnantepsa”, a song from the recently released album by Vlahos which was recorded by Paschalidis. Miltos Paschalidis and Mirela Pachou also presented a very moving rendition of the hit song “Diodia”, as a tribute to AKTINA’s and CYPRECO’s member, Polys Kyriacou who wrote the lyrics based on music by Stavros Siolas. 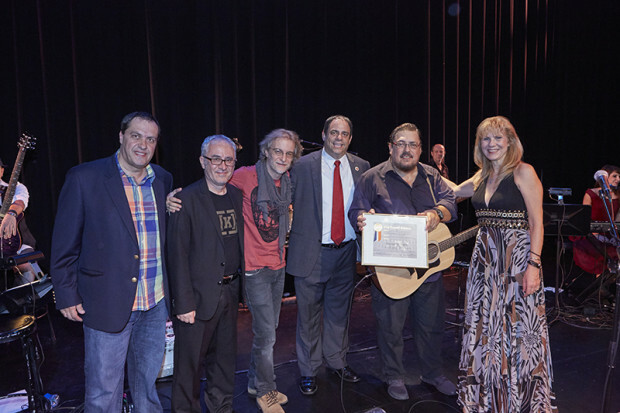 Council Member Costa Constantinides an avid supporter of AKTINA and CYPRECO honored the organizations with his presence and also the lead artist Lavrentis Machairitsas with a Citation on behalf of the New York City Council. As it was announced during the concert and in the printed Playbill, AKTINA’s next concert from its acclaimed series Greek Music Journey brings to New York Greek singing sensation Eleni Tsaligopoulou in her debut personal performance in the U.S accompanied by her band Bogaz Musique in a one of a kind concert that will revive her hit songs from her personal discography including everlasting rembetika and laika. Tickets are on sale. To charge tickets call AKTINA at 718-545-1151 and for more information visit aktina.org.